D.N.B, MS - Obstetrics and Gynaecology, M.B.B.S. Dr Divya Awasthi is an Associate Consultant in the Department of Advanced Gynecological Laparoscopy and Hysteroscopy (Obs & Gyn) at Max Super Specialty Hospital, Mohali. Dr Divya has done her M.B.B.S and M.S (Obstetrics and Gynecology) from Institute of Medical Sciences, Banaras Hindu University, Varanasi. 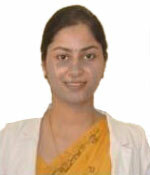 Post that she has done D.N.B in Obs & Gynae from National Board of Examinations, New Delhi. Dr Divya is also a member of Federation of Obstetrics and Gynecology Society of India (F.O.G.S.I) and Indian Association of Gynecological Endoscopists (I.A.G.E). To her credit she was awarded Gold Medal in Anatomy and Community Medicine and also awarded Best Student Award during her M.B.B.S from BHU.